Baffling scenes played out in central Kiev on Tuesday, with artillery rounds going off as several thousand protesters threatened the government with a new Maidan-style protest, erecting multiple tents, setting up cordons and facing off with riot police. A battery of howitzers dispatched not far from the site of the planned anti-government protest outside the Verkhovna Rada, or parliament, building was first reported on social media. A correspondent for Ukrainian Review News said in a Facebook post that “artillery guns” were spotted in the heart of Kiev. It soon turned out that the placement of weapons might not be related to the demonstration, which was calling for parliamentary immunity to be revoked and for reforms to the electoral system. A spokeswoman for the Prosecutor’s Office said that instead the artillery was there to honor visiting Maltese President Coleiro Preca. The two events were a “stupid coincidence,” she said. The authorities maintained protocol and fired off a 21-gun salute, bewildering those who hadn’t heard the news. A YouTube video captured the sound of howitzers firing not far from the crowd as people looked confused and somewhat disconcerted with the salute. Police briefly clashed with protesters as they broke through metal fences later Tuesday, and the Ukrainian Interior Ministry said that one policeman was injured in the scuffles. One demonstrator was allegedly beaten and then taken to the hospital. Protesters then erected several tents outside administrative buildings. The rally, which began as a parliament session was taking place in the Verkhovna Rada, was called by Mikhail Saakashvili, the former Georgian president and ex-governor of Ukraine’s Odessa region, who has been stripped of his Ukrainian citizenship but made his way across the Polish-Ukrainian border with the help of a crowd of supporters, including some opposition figures. On Tuesday, Ukrainian MPs were debating political reforms, including the cancellation of immunity for parliamentary deputies. The draft bill was introduced to the parliament by President Petro Poroshenko on Monday. 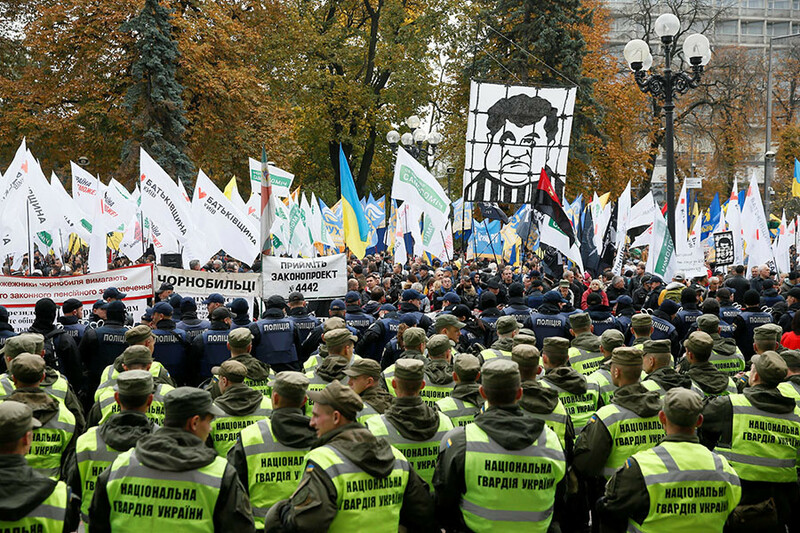 Poroshenko was one of the primary targets of the protest, with one large placard showing an image of the Ukrainian president behind bars. Saakashvili, who previously was Poroshenko’s friend and ally but is now engaged in a bitter feud with the oligarch-turned-president, is calling for Poroshenko’s impeachment. 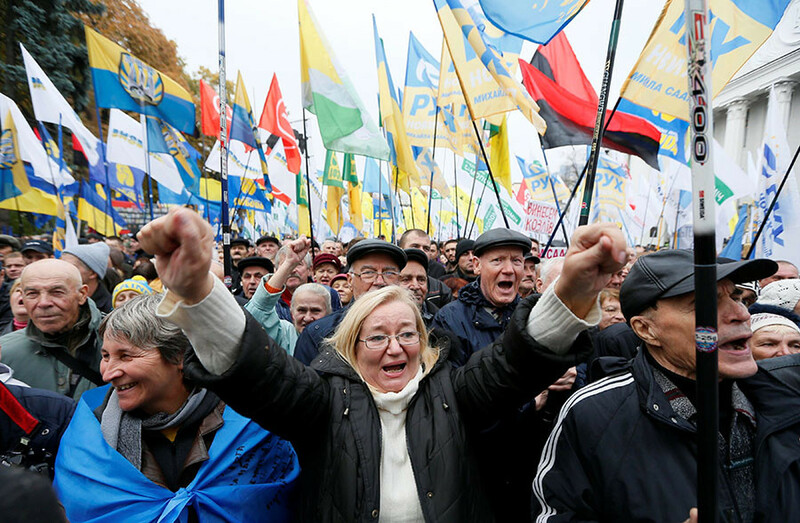 Tuesday’s rally saw 6,000 people joining anti-government protests in Kiev, with around 4,500 people rallying outside the parliament building and some 1,500 protesters near the National bank of Ukraine, according to national police chief Andrey Krischenko. While various political movements called on people to join Monday’s protests, which were taking place not only in Kiev but also in other cities across Ukraine, not all the opposition forces supported Saakashvili’s protest on Tuesday. Far-right political party the National Corps admitted “the possibility of joint actions for the sake of achieving the goal,” but stressed that it disowned the former Georgian president’s position. Saakashvili, who was one of the political figures supporting the 2014 coup on Kiev’s Maidan, or Independence Square, earlier said that his dream was “to change [the authorities] in Kiev” and called for the impeachment of President Poroshenko. 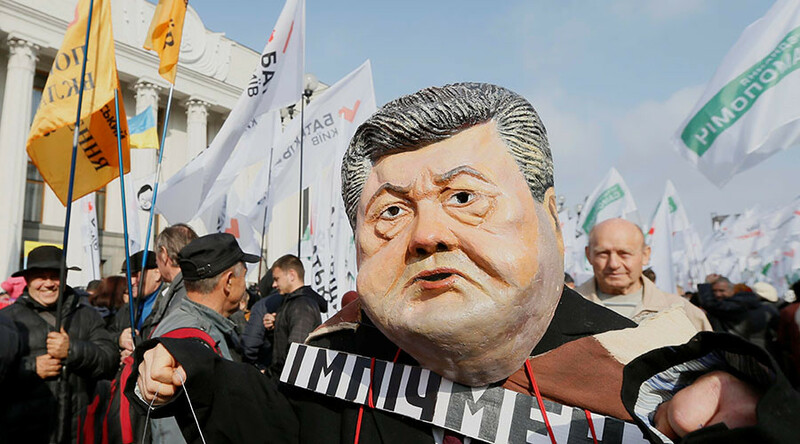 He repeated those calls in front of his supporters during Tuesday’s protest, saying that while Poroshenko is in power there will be no progress on reducing poverty and in the fight against corruption, Ukrainian media reported, citing Saakashvili.